Obama: 'Running Out Of Time' For Deficit Deal : The Two-Way The president said, "we know how we can create a package that solves the deficits and debt for a significant period of time. But in order to do that we've got to get started now." "We have a unique opportunity to do something big" and put the federal government's fiscal books in order for the next decade or so, President Obama said this morning at a White House news conference where he again laid out his view of where things stand in deficit-reduction talks with Republican leaders. And during his second news conference of the week, the president made the case that Republicans haven't yet been willing to embrace what he calls a "balanced" approach to deficit reduction that includes spending cuts and increases in tax revenues. Republican leaders, meanwhile, continue to say that the president is wrong to be talking about asking anyone to pay more in taxes at a time when the economy remains weak. We live-blogged as it happened. Later, Frank James will have some analysis over at It's All Politics. Click here for our coverage of his Monday news conference. During his news conference, as you'll see below, the president mentioned several times that "80 percent" of Americans favor what he refers to as a "balanced" approach to deficit reduction that combines spending cuts with some increases in tax revenues. We pointed to Pew Research polling on the issue. -- 20 percent of those surveyed said deficit reduction should come "only" through spending cuts. -- 30 percent said it should come "mostly" through spending cuts. -- 32 percent said the mix should be equal parts spending cuts and tax increases. -- 7 percent said "mostly" tax increases. -- 4 percent said "only" tax increases. A Quinnipiac University poll this week showed 67 percent of those surveyed said that "an agreement to raise the debt ceiling should include tax hikes for the wealthy and corporations, not just spending cuts," vs. 25 percent who opposed such a mix. Check the links to those poll reports for data on their methodology. Update at 1:20 p.m. ET. Boehner Says Obama's "Deeds Aren't Matching His Words." "President Obama has been talking tough about cutting spending, but his deeds aren't matching his words. Consider all of the government boondoggles he has refused to put on the table for cuts: ObamaCare; the so-called 'green jobs' initiative; high-speed rail; and a vast array of other pet projects that are unnecessarily costing taxpayers hundreds of billions of dollars. While Republicans have focused on the big problems we face, this White House has focused on protecting the status quo. The same holds true for entitlement spending, where the White House has been talking in terms of nickels and dimes at a time when trillions of dollars in serious reforms are needed to preserve the programs and put them on a sustainable path. "As Moody's and Standard & Poor's have signaled this week, our nation's economy is literally begging for Washington to take meaningful action to cut spending and reduce the deficit. It is absurd and self-destructive to continue dumping taxpayer money into a 'stimulus' philosophy that has consistently failed to support private-sector job creation in our country. The White House must step up and embrace real spending reforms and cuts that will show job creators America is finally serious about addressing the debt. Democrats and Republicans must lock arms together in the days ahead and take real action to stop the spending binge that has put our nation in economic jeopardy." On the NPR broadcast a moment ago, Talk of the Nation host Neal Conan made the point that though the president says he's holding out for what he calls a "balanced" approach in order to get the nation's fiscal house in order, Republicans such as House Majority Leader Eric Cantor (R-VA) are making the case that this is a unique opportunity "to restructure" the way the way things are done in Washington and bring spending in control. "We're running out of time" to get a deficit-reduction and debt-ceiling deal done by the Aug. 2 deadline when the government runs out of money to pay its obligations, the president says. "That's the main concern I have at this point." But, he continues, "we know how we can create a package that solves the deficits and debt for a significant period of time. But in order to do that we've got to get started now." And he makes the case that progressives and conservatives alike should both "be concerned about debt and deficit [reduction]" because "if you care about making investments in our kids ... infrastructure ... research ... then you should want our fiscal house in order." 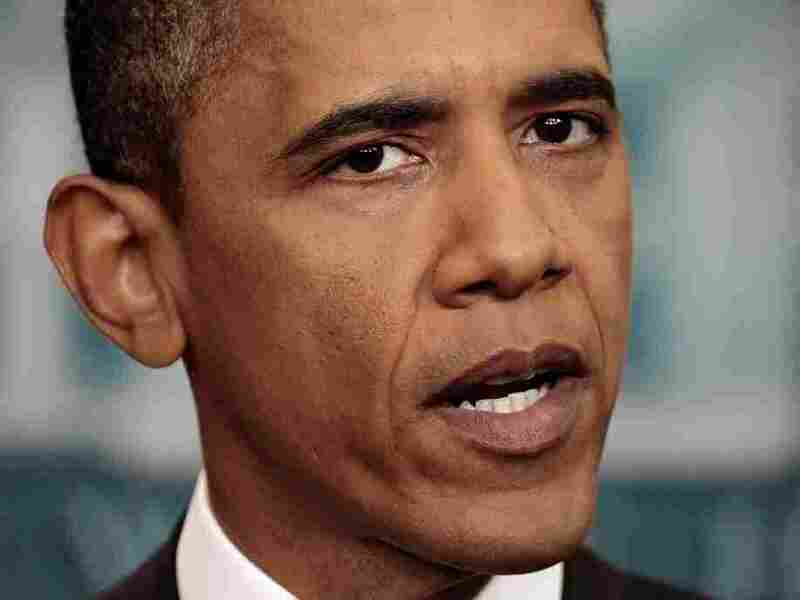 Isn't the 2012 campaign rhetoric already making it hard to get a deal, Obama is asked? After saying there will be plenty of time for "a big, serious debate" in the campaign, the president says that "in the meantime, surely we can every once in a while sit down" and get things done. Asked why he has hope that a big deficit-reduction deal will be reached, the president chuckles as he says "I always have hope. Don't you remember my campaign?" Again making his case for a "balanced" approach that combines spending cuts and increases in tax revenues, the president says "the American people are sold" on that approach. "Eighty percent of the American people" support dealing with deficits with a combination of spending cuts and increases in tax revenues, Obama says. The Pew Research Center has a lot of polling data on how Americans feel about deficit-reduction posted here. Update at 11:21 a.m. ET. The Republican View. "[House Speaker John] Boehner ... complained that Obama has not put a viable plan on the table. Earlier, House Budget Committee Chairman Paul Ryan (R-WI) accused Obama of being unwilling to embrace the level of spending cuts necessary to avoid constant repetitions of the debt stalemate currently gripping Washington." "If we're serious about this and everybody's willing to compromise," the president says, " we can fix this thing [deficits] for a decade or more." It's been widely reported that lawmakers have tentatively agreed on about $1.7 trillion in spending cuts over the next decade or so. The goal is to get to about $2.4 trillion — the amount by which the administration wants to raise the debt ceiling. Obama says "I have not seen a credible plan" from Republicans "that would allow you to get to $2.4 trillion without really hurting ordinary folks." Update at 11:12 a.m. ET. "Means-Testing" Or Raising Social Security's Retirement Age? Asked for any specifics he can offer about specific spending cuts he could accept, the president is quizzed about the possibility of "means-testing" Social Security or raising the program's retirement age. "We've said that we are willing to look at all those approaches," the president says. "Modest modifications" can save billions of dollars, he adds, and it would no be — and he does not favor — necessary to make major modifications to such programs. "If you're a senior citizen and a modification potentially costs you $100 or $200 a month more, ..." Obama says, returning to his view on the need for "balance," ... "the least I can do is say that people who are making $1 million or more" are also sacrificing. "I am still pushing for us to achieve a big deal," Obama says, "but what I also said to the [leadership] group was that if we can't do the biggest deal possible then let's still be ambitious. ... At least get a down payment on deficit-reduction." Update at 11:03 a.m. ET. "Unique Opportunity:"
"We have a unique opportunity to do something big" and get the federal government's fiscal house in order for years to come, the president says. But doing so, he says, will require not just major cuts in projected spending but also that "millionaires and billionaires ... do a little bit more" in the form of paying more in taxes as loopholes are closed. Update at 11 a.m. ET: Getting started a couple minutes early, the president begins by saying that it is "encouraging that everybody believes this is something that needs to be addressed" — referring to the need to increase the federal government's debt ceiling by Aug. 2. Update at 10:50 a.m. ET: According to a message on the White House Twitter page, "the president will speak on the status of efforts to find a balanced approach to deficit reduction." It has been the president's position that Republicans aren't willing to "balance" spending cuts with some increases in tax revenues — achieved, he says, largely by closing loopholes that now benefit "millionaires." Republican leaders say the White House has been insisting on tax increases at a time when doing that could damage an already weak economy.